Last week, Luke O’Neil, an independent journalist, wrote a piece for the Boston Globe in which he expressed regret for not defiling political pundit Bill Kristol’s salmon when, as a waiter, he had the chance. He also encouraged restaurant workers to make life uncomfortable for Kirstjen Nielsen, the former Secretary of Homeland Security, the department responsible for separating children from their asylum-seeking families at the Mexico–US border. Thankfully, the media critics of America then came storming to Luke’s defense, decrying the attack on editorial independence. While a Washington Post reporter at least covered the basics, media watchdogs did absolutely nothing – along with pretty much everyone else. It doesn’t matter what you think of Luke’s politics, or even the tone he took in the article. (At first, the Boston Globe’s editors, who shared the piece on their social media accounts, sure seemed to like it.) If you care about a free press that can actually hold power to account, this should scare the hell out of you. These billionaire buy-outs may seem like the only way forward. The Washington Post has been doing good work under the ownership of Jeff Bezos, and folks at the LA Times certainly seem optimistic since biotech entrepreneur Patrick Soon-Shiong bought the paper last year. But this new status quo puts the power of censorship into the hands of the already powerful. For instance, after casino magnate Sheldon Adelson secretly bought the Las Vegas Review-Journal, many of the paper’s top reporters left in protest, including an investigative reporter who was told he couldn’t report on Adelson. Sam Zell effectively killed the Tribune Company, owner of the Chicago Tribune, by loading it with debt and treating it like a real estate development. And in Hong Kong, Jack Ma, the founder of Alibaba, is turning the South China Morning Post decidedly pro-China. This might all seem like a minor kerfuffle over a foul-mouthed freelancer, but it’s really a story about how media power and influence is increasingly being consolidated in a fringe wealth class, to the detriment of the public interest. That class has little interest in safeguarding the freedom and independence of the press. At minimum, some of its members have already proven willing to crush stories they don’t like. And it should be obvious: even if you don’t share Luke’s politics, a world where feigned outrage on social media can cause billionaire owners to get out the ban hammer is bad for anybody who values press freedom. The best way we can fight this trend is to support independent writers directly. That’s the only way we can be sure that writers like Luke can pursue the stories they care about most without compromise. Luke has been able to get stronger out of this debacle because he has readers who pay him directly by subscribing to his newsletter, Hell World. 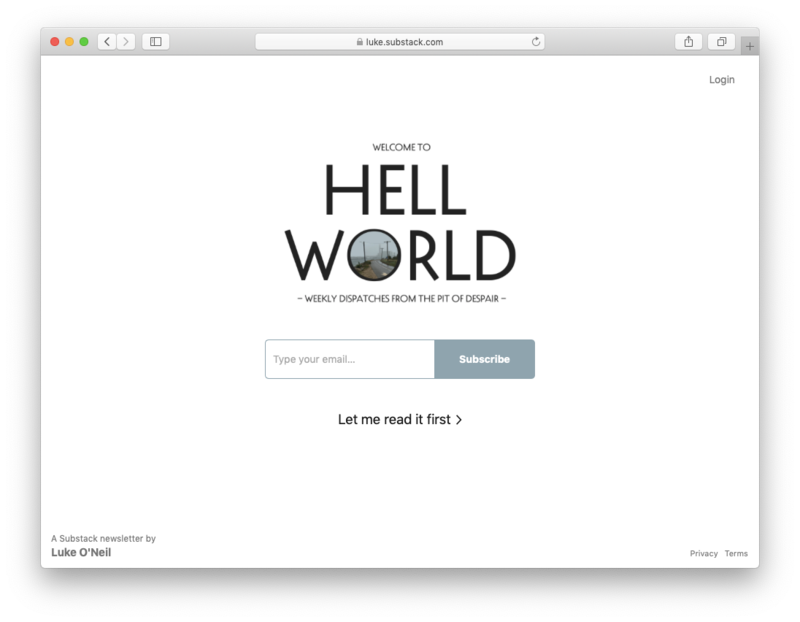 With Hell World, Luke needs to serve no one but his readers.